Posted By PA Breast Cancer Coalition on April 13th, 2018 at 4:02 pm | 0 comments. I was diagnosed through my very first mammogram in 2010 on my son’s tenth birthday. I’m now celebrating seven years post-diagnosis, so he turned 17 and I turned 7. I have dense breasts but didn’t know that at the time and it was before the PBCC had the Dense Breast Notification Act passed. At the bottom of the report though the ob/gyn had written a note to have me follow up in six months with a breast specialist. I went to a breast surgeon who said maybe we’ll just do an exam while we’re in the office. She found the lump right away and suggested taking it out to be safe. Two days later I learned it was invasive ductal carcinoma. WHO SUPPORTED YOU THROUGH YOUR TREATMENT? Every day I had another reminder that I wasn’t in this alone. A lot of people who had been diagnosed reached out, some without even knowing me that well. A friend sent me the book “The Hat That Saved My Life,” written by two survivors who started Breast Friends in Oregon. My friend Vivian and I felt like there wasn’t enough support in our area and the mission of Breast Friends spoke to us. We opened an affiliate in 2012, providing group support, a volunteer matching program, free hat and wig programs, and other direct services. This can be very isolating and I encourage people to allow themselves to accept help. There is so much power in knowing you’re not alone and finding others who speak your language. Family and friends are great but it’s drastically different when you can sit across the table from someone who knows what you’re experiencing. There’s so much you don’t have to explain. YOU’VE ATTENDED SEVERAL PBCC CONFERENCES. TELL US ABOUT THE EXPERIENCE. My business partner Vivian and I started coming to the conference in 2013. Since then we’ve encouraged others to come too because we find so much value in it. We’ve been able to attend with the scholarships which has been very helpful. I love hearing about the PBCC’s strong advocacy with things like the dense breast legislation, what resources there are, and to be able to share that with others afterwards. DO YOU HAVE ANY ADVICE FOR SOMEONE WHOSE FAMILY MEMBER OR FRIEND IS DIAGNOSED? Sometimes the patient doesn’t want to share with their family members because they don’t want them to feel bad. But this creates a disconnect. It’s also important for caregivers to feel safe about sharing their experience of caring for someone on a cancer journey. It has a ripple effect; it impacts everyone. I use the term co-survivor and I think that validates what people experience alongside their loved one. WHAT DO YOU THINK IT WOULD BE LIKE WITHOUT THE PBCC? Without the PBCC, there would be no voice. You have provided a voice for women who didn’t even necessarily know they needed one. What you do is amazing! Posted By PA Breast Cancer Coalition on February 20th, 2018 at 12:18 pm | 0 comments. In the summer of 2015. I felt a lump in my breast and went to my family physician for a clinical breast exam. She referred me to a surgeon, then the surgeon ordered an ultrasound and mammogram. The results showed a tumor and she thought it might be fibro adenoma because of my age. Why? What was your age? I was 25 years old at the time. What happened next? What was your treatment? The surgeon asked me what I wanted to do, either a needle biopsy or a surgical biopsy. I chose the surgical biopsy for two reasons. I am from Dallas, Texas and was headed to Pennsylvania to pursue a Ph.D. at Pennsylvania State University. The second reason was that I didn’t want to be awake during the procedure. In June 2015 I was diagnosed with invasive ductal carcinoma, stage 2. I went to one hospital for diagnosis and a different hospital for treatment. I had six rounds of chemo, then a double mastectomy, and after that I went through immunotherapy. I chose a double mastectomy because I had a genetic mutation p53. All this went from December 2015 all the way to August 2016 in Texas and then I started school at Penn State in August 2016. What are you doing currently at Penn State College of Medicine in Hershey? I transferred a doctoral degree in public health at Penn State College of Medicine in Hershey in August 2017. My mentor is Dr. Kathryn Schmitz and she’s the reason I transferred here. 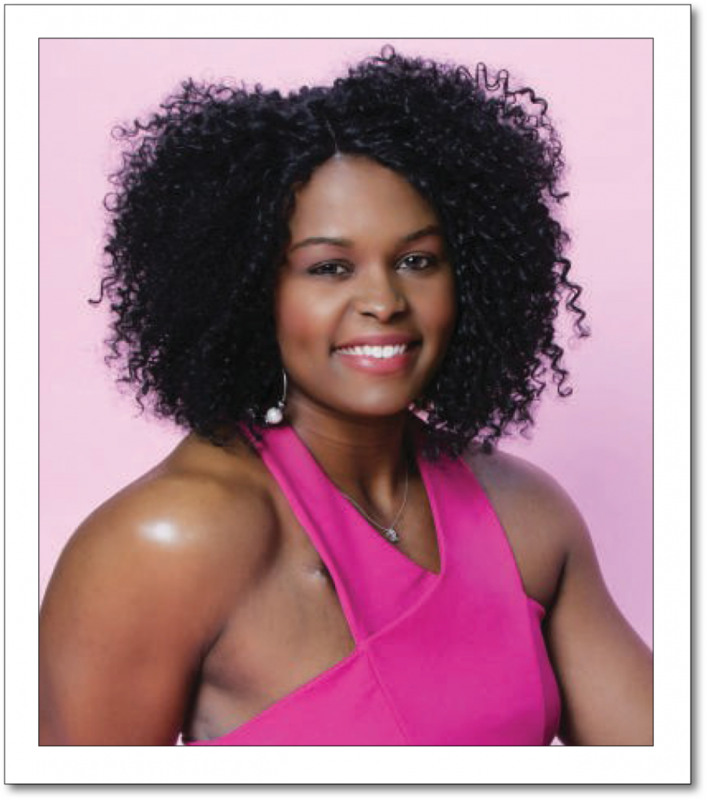 She’s an exercise interventionist and promotes exercise to limit the side effects of chemotherapy. Who supported your throughout your treatment process? The support was multi-faceted, both through the Affordable Care Act and my dad’s insurance during treatment. When I turned 26 in August I got different coverage but the hospital wasn’t accepting my insurance. My friends and family covered some of my expenses via GoFundMe. My mom was my primary caregiver and she devoted everything to getting me better. I was heading to the Broad Street Market in Harrisburg and saw a sign outside the Hilton. I went to the PBCC website and found all the information I needed there. What was your experience like at the 2017 PBCC Conference? I applied for a scholarship to the conference. I wouldn’t have been able to come otherwise. I gained so many insights! Dr. Cliff Hudis gave a really great presentation on obesity, breast cancer, and inflammation. I liked how he talked about post-menopausal women who might be obese at diagnosis and may have worse outcomes later and increased inflammation. It’s such an important thing to talk about. We don’t really know if obesity affects the whole cancer continuum from diagnosis to survivorship. It may contribute to all of it. It was cool being there and meeting so many survivors. Is there something you’d like other women to learn from your story? The more information you have, the better. Be aware of any changes. I tell people to stay active. The CDC recommends that adults participate in 150 minutes of moderate physical activity per week. That breaks down to 30 minutes a day for five days a week. Do you have any advice for someone whose friend or loved one is diagnosed? Yes. My mom was involved and knew what was going on and was patient with the process and asked a lot of questions. Educate yourself about the topic and find healthy foods to prepare for the patient. Make sure the patient is not sitting around too much, go for a walk with them. Reach out to others who are going through the same thing, maybe with a support group for caregivers. Posted By PA Breast Cancer Coalition on February 2nd, 2018 at 9:20 am | 0 comments. HOW WAS YOUR BREAST CANCER FOUND? That was with a regular annual mammogram in 2007. I had a lumpectomy and chemo and radiation. I’d been doing well until October 22, 2017 when I diagnosed with uterine cancer which we think may have been a result of some of the chemotherapy drugs. I’m back in chemo but this time it will be every week for 18 weeks with lower doses of chemo. That’ll be better on my body, easier to tolerate. With both diagnoses, whatever the doctor said … boom, boom, boom, I said let’s get this party started. WHO SUPPORTED YOU THROUGH YOUR JOURNEY? I had all the support in the world! My mother came and stayed with me for nine months, which was one of the best times of my entire life. We were always close, but being a grown-up and having my mother take care of me made me fall in love with her all over again. My Jehovah’s Witness congregation and my friends not only brought food and treats but also flowers for my mom. They would come and sit with me so she could go out and still do things like get her hair done. The staff at Hahnemann Hospital was phenomenal. I’ve been with them for ten years now and they’ve become like family. When I got my chemo schedule I sent it out and I have a different person going to each appointment from January through April with me. WHEN DID YOU FIRST KNOW ABOUT THE PBCC? 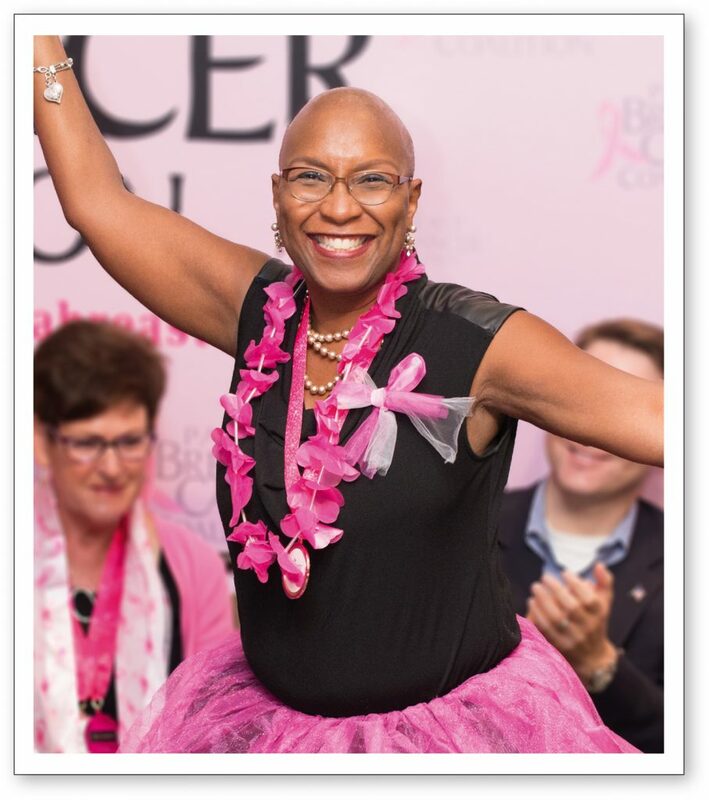 The oncology social worker at the hospital put me in touch with Living Beyond Breast Cancer and some of the women I met there introduced me to the PA Breast Cancer Coalition. My first PBCC conferences were in 2016 and 2017 and I received scholarships both years. I wouldn’t have been able to come otherwise. The first year I wore a little pink and black tutu to the Pink Party and I won the costume contest! TELL US WHAT YOU LIKED MOST ABOUT THE CONFERENCE. The speakers were knowledgeable but presented the information in a way that wasn’t over your head. There were topics you could use in your everyday life. I could go home and feel like I absorbed everything and would be able to share it. WHAT ADVICE DO YOU GIVE OTHER WOMEN? It’s important to talk and it’s important to listen. Do not let anyone rob you of how you feel and don’t let anyone else put their story on you. We need to watch what we say to one another. My hair never grew back and every once in a while someone will say that it’s the style now. I don’t want to hear that it’s the style. When it’s not your choice, it’s not a style. And don’t tell me I have a beautiful head. I want hair on top of it like yours. DO YOU HAVE ADVICE FOR SOMEONE WHOSE FRIEND OR LOVED ONE IS DIAGNOSED? It’s not rocket science but you can move mountains when you try. If you’re miles away, send them a card to let them know you’re there for them. Or send them a little gift card that they can use to put gas in their car. I even needed people to read to me because one of the medications made my eyes too watery to read. A little tenderness and thoughtfulness will go a long way. WHAT IF THE PBCC DIDN’T EXIST? People would die. Plain and simple. You offer lifesaving programs and information about mammograms and coverage for treatment that people wouldn’t even know about otherwise. Posted By PA Breast Cancer Coalition on January 23rd, 2018 at 8:30 am | 0 comments. Our 2018 research grant recipients are studying better detection for breast cancer, genetics and breast density. The PA Breast Cancer Coalition remains focused on supporting scientists working to find the cause of and cure for breast cancer. Want to bring us closer to that cure? Donate your state income tax refund to the PBCC on Line 32 and every penny will support Pennsylvania breast cancer researchers! Posted By PA Breast Cancer Coalition on January 21st, 2018 at 9:10 am | 0 comments. It’s a breakthrough for advanced breast cancer patients with BRCA1 or BRCA2 gene mutations. The U.S. Food and Drug Administration last week approved its first treatment for advanced breast cancer caused by the inherited mutations. The drug, Lynparza (olaparib tablets), was previously approved to treat advanced ovarian cancer caused by mutations of BRCA1 or BRCA2. 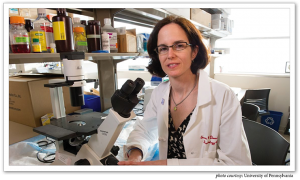 University of Pennsylvania researcher and previous PBCC Research Award winner Dr. Susan Domchek co-led the study that led to the drug’s approval for breast cancer. Dr. Domchek calls the drug’s approval a significant advance for those women with triple-negative breast cancer and a BRCA mutation. Posted By PA Breast Cancer Coalition on January 20th, 2018 at 10:27 am | 0 comments. Did you know? Medicare covers post-mastectomy or lumpectomy bras. Doctors may order FREE bras (up to $30 each) for breast cancer survivors who have had a mastectomy or lumpectomy and are covered under Medicare. Medicare covers the first $30 of each bra and the woman is responsible for any costs above that amount. Survivors who have had reconstructive surgery are also eligible for free bras. More information to come in future PBCC publications! Posted By PA Breast Cancer Coalition on January 16th, 2018 at 2:26 pm | 0 comments. 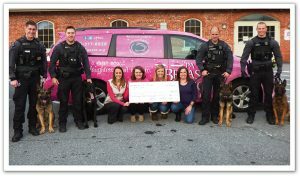 Taking a Bite Out of Cancer, the Lancaster City Police K-9 and Mounted Units held a special fundraiser for the PA Breast Cancer Coalition in October 2017. Officers sold pink t-shirts in honor of breast cancer awareness month, with a portion of proceeds benefiting the PBCC’s life-saving work throughout the state. The first annual campaign was a doggone success, with a total of $562 going to our programs and services for breast cancer survivors in PA! The PBCC staff was thrilled when the K-9 unit stopped by our office to deliver the donation with dogs in tow! Thank you to Officers Alexander, Reppert, Hatfield and Bradley for bringing K-9s Axel, Stryker, Zoltan and Wodan to our headquarters in Lebanon for this presentation, and to Sargent Michael Gerace for spearheading this unique campaign! The PBCC is honored to be the recipients of this meaningful gift. Posted By PA Breast Cancer Coalition on November 30th, 2017 at 10:41 am | 0 comments. 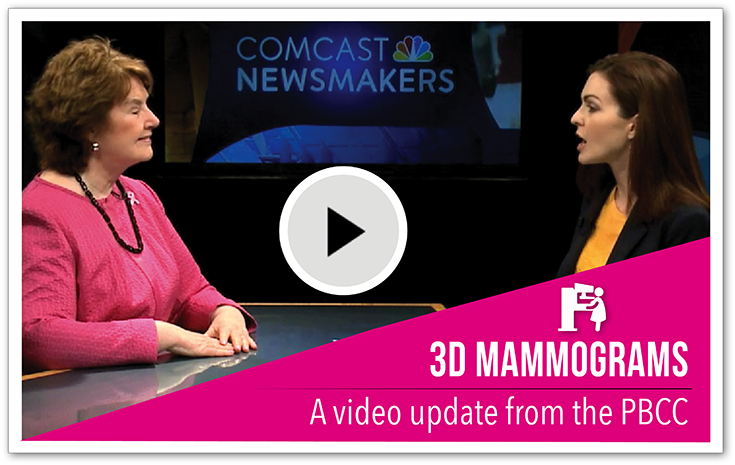 PBCC President and Founder Pat Halpin-Murphy recently sat down with Jill Horner of Comcast Newsmakers to talk about the importance of free 3D mammography and early detection of breast cancer. 3D screening mammograms are FREE for all women insured under Pennsylvania law. Thanks to Governor Tom Wolf, PA is the first state in the nation to offer this technology at no additional cost to the woman. So… why not get one? 3D mammograms offer better detection and fewer callbacks. The PA Breast Cancer Coalition provides the only online database of 3D mammography centers in the state, by location. Currently, 213 facilities in Pennsylvania offer 3D mammograms. Click here to find a center near you.